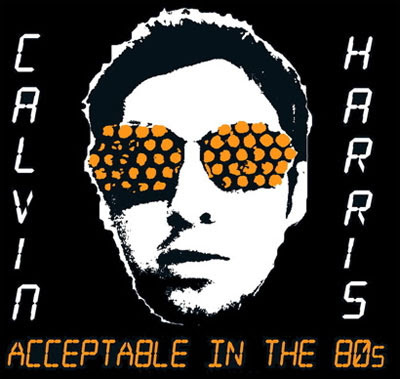 Calvin Harris's debut album, with the subtle title "I Created Disco", cost 0 p. to record. He fashions future-disko using an ancient Amiga computer and is, right now, (literally) knocking together a stonking live set using MDF and 204 samples. "My live band's gonna be even more rocking than the tunes. I'll be singing, but only because no one else in Dumfries can sing. I've got an extremely limited range. But I will be wearing a top hat made from the skin of a tiger. Calvin Harris is one of those 'myspace sensations' you keep reading about. He was wildly popular amongst The Kids and on The Club Scene, a cult producer - slash - singer - slash - bedroom - knob - twiddler who can make the banging-est of pop-dance tunes out of bugger-all kit. The last time he spent any money on gear was three years ago, when he bought a voice processor for £200. "I'm not the kind of dude who buys Sound On Sound. I know if something sounds nice. If it does, I'll keep it. If not, I'll try and make it nice. You don't need to splash out on technology."